The USBG-4SU2MLA is an USB 2.0 Hub that complies with the Universal Serial Bus (USB) Specifications Revision 2.0 and work up to 480Mbps. 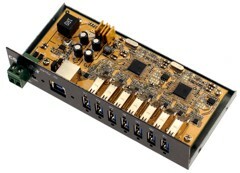 It provides 4 downstream facing ports with standard A-type USB 2.0 connectors. It supports screw lock features for both upstream (USB type A) and downstream (USB type B) connectors with the screw lock USB cables. It prevents from disconnecting the USB cables accidently. Screw Lock Cables NOT included.